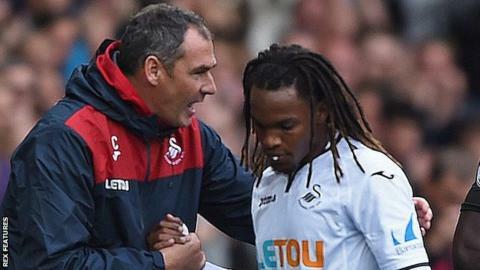 Head coach Paul Clement is confident Swansea City will see the best of midfielder Renato Sanches during his season-long loan from Bayern Munich. Portuguese international Sanches has struggled with form and minor injuries since joining the Swans in August. The 20-year-old is fit for Saturday's Premier League game at home to Leicester, and Clement believes he will realise his potential in time. "He's a really good player. It's about getting him up to speed," said Clement. "He's missed a lot of football and his confidence has been damaged. "Fitness and the tactical side has dropped and we're picking all that up now." Sanches joined Bayern from Benfica for 35m euros in May 2016 but found first-team opportunities limited with the German champions. Clement worked with the Euro 2016 winner during his time as Carlo Ancelotti's assistant manager at the Allianz Arena, and he seized on the opportunity to sign the highly-rated youngster on transfer deadline day. Despite the hype which followed his arrival, Sanches has yet to impress in his five Swansea appearances to date. However, Clement is not surprised the new signing is taking time to settle. "I probably expected that, be on that upward curve with his performances," he added. "I think his performances are picking up, he's trained really well this week and I've seen some of the best things in him this week. "His physical attributes, he's got strength and power. Technically he's a midfielder who can go past someone with the ball. "He can go past players with or without the ball. When he gets that right foot going he's got a thunderous shot on him. "Now it's about transferring that to the game and with Leroy [Fer] suspended he has a good chance to be involved in the starting XI."